Do you know how long do polar bears sleep in a 24-hour day? 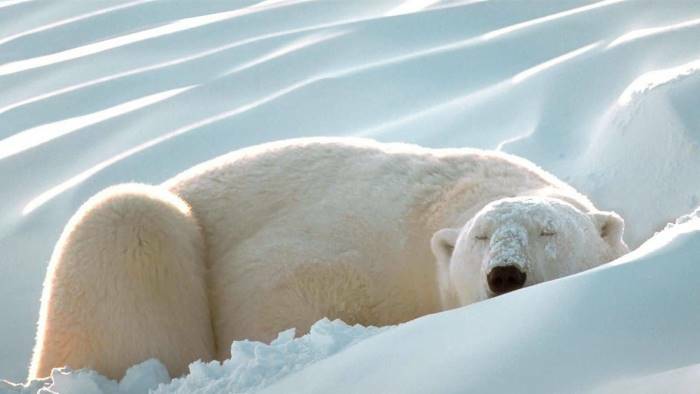 Well, you will not believe that polar bears sleep as much as we do. 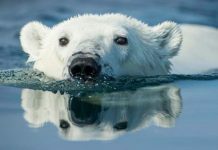 Scientists have lately collected polar bear sleeping data and they concluded that the average length of time polar bear spends in sleeping is estimated at just over 7 hours each day. Now let us study in detail about the sleeping pattern of a polar bear. 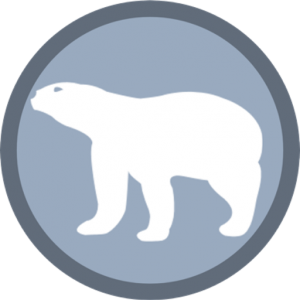 How Long Do Polar Bears Sleep? 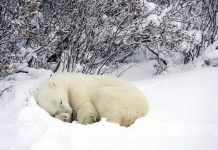 Although polar bear generally spends a quarter of their daily time sleeping they have different sleep sessions. They will continuously sleep for up to an hour. The average length of time is estimated at 7 hours and 45 minutes which probably matches our sleeping time. During summer, polar bears usually sleep more during the day as compared to night. But the overall sleeping time in 24-hour daylight remains the same. 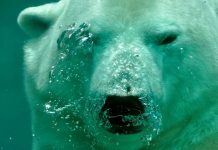 Polar bears can also become active at night because sometimes seals come to the ice floes. Ringed seals are thought to emerge at night to feed on their prey. 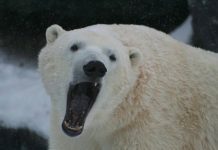 It indeed increases the polar bear’s chances of catching a seal for the latter shows up in a breathing hole. See also: Where Do Polar Bears Sleep? Polar bear sleeping in a shallow ice pit. The bear will be covered with snow during windy hours. How long do polar bears sleep? When Do Polar Bears Sleep? Polar bears usually fall sleep 60 to 100 minutes after the feast. They become little lethargic (just like we do) after the meal. 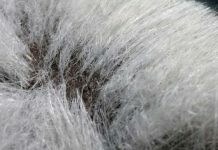 Unlike maternity dens, shelter dens are not really permanent. Polar bears use shelter dens for specific purposes. They will never raise their cubs in a shelter den or pit. Polar bears build shelter dens not only on the sea ice, but also on land. During summer, the polar bear will use shelter dens to sleep while waiting for the sea ice to return in winter. In winter, polar bears are thought to use shelter dens quite regularly. They may stay in these less-developed dens for as long 1 to 4 months in winter.